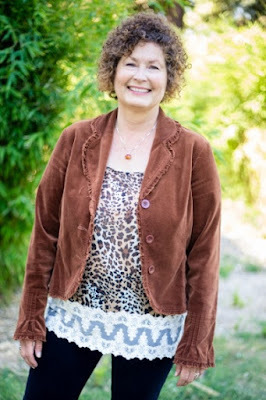 I'm delighted to feature fellow WRP author Mary Morgan's latest release on the Flight Deck today: - Wishing you much continued success Mary! Death destroyed their love. Yet, can a trio of Fenian warriors roll back time to reunite two lost souls? Crusader, Adam MacFhearguis is on one last quest to the standing stones in Scotland where he seeks to bury the past. However, a silent prayer sends him to an unknown future and to his beloved Meggie. When he uncovers a shocking revelation, Adam questions everything about the woman he thought he knew and loved. He may have traveled the veil of ages, but time is now his enemy. Margaret MacKay lives a life in the future without the memories of her past—her death. When Adam arrives at her door confessing he knows her, she is confused and wary. With each passing day, she yearns to learn more from this stranger. Yet, when a truth is revealed, can she trust the man to unlock the chains from her mind and heart? She snatched her hand back. “I’m not peering inside the man’s belongings. As soon as he wakes, he and his horse can leave.” Giving the horse a firm pat, Meggie walked out of the stall and away from her smirking cousin—only to run smack into her other cousin, Lena. “Ye are both crazy,” protested Meggie. “He’s just a man.” Stepping past them both, she marched away from the stables. Approaching the entrance of the castle, her nerves tingled and the air cooled. Halting on the gravel courtyard, she slowly glanced up at the guest bedroom window. Gazing down at her was the dark Highlander. His hands were braced on either side of the glass, and Meggie could swear for an instant, she recognized him from somewhere. A dream, perhaps? The look he gave her pierced her soul, and she shivered. Breaking from his stare, Meggie entered the castle, almost running up the stairs. By the time she reached the guest room, her hands were shaking. Not even bothering to knock, she pushed open the door and stormed inside. Her mouth became dry, unable to form the words to order this giant out of her home. His bulk blocked the light from the window as he leaned against the ledge staring at her. She was not one prone to swoon at men—any man, but this one made her a jumbled mess. Moving to the table, she picked up his sword and took it over to him. His eyes widened as she approached and she fell into their dark blue depths. “I…um…” she stammered before continuing. “Ye should leave.” There, she got the words out. Instead of reaching for his sword, the man lifted two fingers and caressed her cheek. She gasped, the touch searing her skin, and she took a step back. She could see the look of shock pass over his features, as if he felt the same reaction. Meggie shoved the sword into his arms and ran for the door. Yet, when her hand touched the handle, she heard him speak. 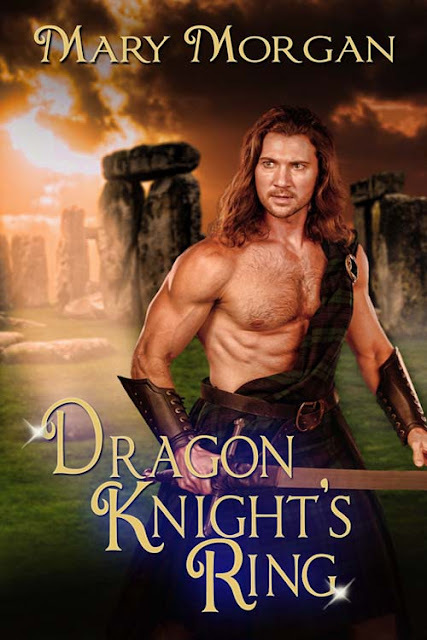 Scottish paranormal romance author, Mary Morgan resides in Northern California, with her own knight in shining armor. However, during her travels to Scotland, England, and Ireland, she left a part of her soul in one of these countries and vows to return. A signed print copy of Dragon Knight’s Ring. $25 Amazon gift card. Jeweled bookmark, and a Keychain with cover of book.